Welcome to Guadeloupe Guide, your guide to all things Guadeloupe! This site is intended to help you as you plan your trip to this wonderful French Caribbean island. Have you recently booked a trip to Guadeloupe and feel overwhelmed by all the planning you need to do? No worries – you have come to the right place. My new English language e-book “The Quick Gwada Guide” will get you prepared in no time! If you buy my e-book and still have unanswered questions, feel free to get in touch over email. I’m happy to help out. Are you interested in private island tours of Guadeloupe? If you’d like to do a lot of sightseeing but would rather not drive yourself, my personalized island tours are something to consider. Or are you just browsing around and looking for vacation inspiration and ideas? 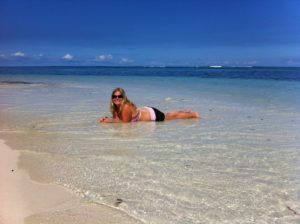 Check out my blog, where I share some glimpses about life in paradise. Either way, welcome onboard! Hope you make it out to lovely Gwada sooner rather than later! More about me: I’m a US-educated freelance journalist and travel writer, originally from Finland. Over the past three decades I’ve traveled to about 80 countries and chilled on hundreds of beaches. Based on my experiences, I can tell you that Guadeloupe has some fine playas indeed! Before Gwada I lived in New York and graduated from the City University of New York Graduate School of Journalism. While I loved the hustle and bustle of the world’s greatest city, I’m now more than happy with my laid-back island life.